A large stationary diesel power plant has been undergoing various life extension projects for base load HFO fuel power generation. Original design primary HFO fuel heating for an older section of plant was a steam based on two oil fired boilers, shell and tube exchangers and condensing systems. 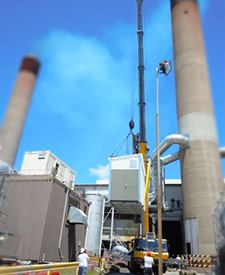 The steam heating system is more than 20 years old and is in need of replacement. Northwest Electrical Services LLC executed an engineering study to determine the optimal solution to replace the critical fuel heating with these factors driving the recommendations. Ability to re-purpose any proposed fuel heating to other areas of plant. Increased efficiency of the system with lower overall fresh water consumption. Minimal, if any, downtime of base load units while the new system is installed and commissioned. 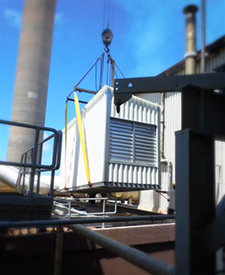 The engineering study concluded that a conversion of steam to HTHW would be the optimal solution, meeting all of the above criteria, with an innovative solution to the challenge of installing the conversion without downtime of existing units integral to the success of the proposal. 2 X 100% capacity boilers with redundant primary and secondary circulation pumps. HTHW Plate and Frame Heat Exchangers. Custom fabricated skids and enclosures for all outdoor equipment including boilers and circulation pumps. Structural steel, grating and supports. Electrical and control systems, including integration to existing systems. Commissioning, training and final documentation. The project was completed Q1 2013.